LOS ANGELES, CA (January 14, 2011) – Hot off the record-breaking ratings for the fourth-season premiere last week, SHOWTIME is picking up a fifth season of CALIFORNICATION, it was announced today by Showtime Networks President of Entertainment David Nevins. 12 new episodes of the hit comedy series will go into production this spring. CALIFORNICATION’s fourth season premiere delivered its best-ever premiere with over a million total viewers for the night. The series follows the exploits of writer Hank Moody (David Duchovny in his Golden Globe(R) Award-winning and SAG Award-nominated role) as he works to balance his career, ex-girlfriend, daughter and hedonistic vices. This season, Hank enlists the help of high-powered defense attorney Abby (guest star Carla Gugino) to keep him out of prison after he’s charged with bedding a then-underage Mia (guest star Madeline Zima). Fourth season guest stars include Rob Lowe, Zoe Kravitz, Stephen Tobolowsky and rocker Tommy Lee will make a cameo, as well. 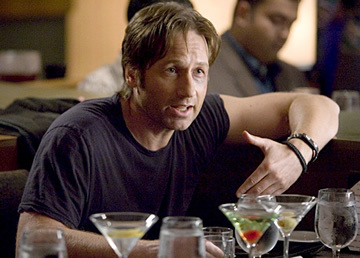 CALIFORNICATION is created by Tom Kapinos and executive produced by Kapinos and Duchovny. What do you think? Are you glad to hear Californication is coming back for year five? The only thing I would like seen changed is the 30 show… It has become so popular and people I know want to see the show go to an hour long instead of the 30 minute short show. I heard David enjoyed the short version on an interview but most of us think its just too short but hey what ever they do I’ll be there…. I’ll be there…. I will be there!!! Just curious but did the rating decline when it was with Dexter? Why did they wait until now to put this season on and not back in September with Dexter? But still good it’s been renewed already.